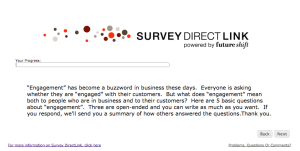 In my previous blog post, I invited readers to take a survey about customer engagement. More than 200 people have taken the survey and you still can. Simply click the link: http://surveydirectlink.com/survey/?name=engagement. We’ve received some very thoughtful comments from people defining what customer engagement is, how companies do it wrong and best practices for doing it right. In a few weeks, we’ll close the survey and then publish a summary so that you can read what people wrote. If you take the survey, you’ll automatically receive the executive report. But even if you don’t take it and you watched Karen Trudell’s Abundance of Gratitude interview series, you can receive the report. Again, if you’d like to take the customer engagement survey while it’s still open, go to this link: http://surveydirectlink.com/survey/?name=engagement. “Engagement” has become a buzzword in business these days. Everyone is asking whether they are “engaged” with their customers. But what does “engagement” mean both to people who are in business and to their customers? Do you think you are “engaged” with the companies you buy from? (e.g. Anybody out there in love with their bank?) How do they think they are engaging you to build brand loyalty? P.S. If you’ve worked with different programs or programmers, you know that MS Explorer often presents some challenges from the other three major browsers (Chrome, Firefox, Safari). Explorer uses a different programming protocol and we’ve found that some survey respondents are having no problem with it and others are. If the survey doesn’t work for you on Explorer, please give it a try on one of the other browsers.